Monoprice® 6" T-Adapter with 1 male ethernet cable and 2 female ports is designed for Cat5e to minimize number of lines needed to connect two distant points. 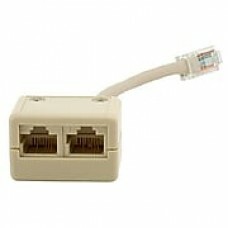 Monoprice® 6" T-Adapter is designed to use with Cat5e features 2 female ports and 1 male ethernet cables that connect to wall plate. T-Adapter allows you to connect 2 ports on a switch, hub or router to 2 different computers.